The aim of this grading standard is to stipulate a norm for different grades of ostrich leather. 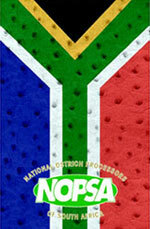 All ostrich leather marketed by NOPSA members will comply with this standard. 1. A defect can be: a hole, a scratch, a loose scab, a healed wound or bacterial damage. 2. The crown is the area with quills, except in the neck, down to the wingfold and also the stomach quill. 3. For grading purposes the crown is divided into four quarters. 4. Dividing lines: The lines dividing the crown area in 4 quarters will be 25mm wide. The vertical line will stretch from base of neck to the bottom or crown and horizontal line will stretch between the widest quill on either side of crown area. 1. A defect in one of the quarters as long as it is not larger than approximately 40mm x 40mm. 2. At least three quarters must be free from defects. 3. Defects on the cutting lines do not affect the grade. 4. A few less visible scars are allowed as long as they are outside the crown area. 1. A skin with defects affecting two quarters. 2. At least half the skin must be free from defects. 3. Visible defects outside the crown area are allowed and will not affect the grading. 1. At least one quarter of the skin must be free from defects. 2. Visible defects outside the crown area are allowed. 1. At least one quarter of skin must be free from defects. 2. Extensive visible defects outside the crown area are allowed and will affect grading. 1. Neck will be trimmed 20cm above featherline. 2. Leg will be trimmed in the middle of "knee". 1. Colour variations cannot be considered as an element to change the grading of leather but is it the prerogative of both buyer and seller to discuss a price adjustment. 2. Tannage cannot be considered as an element to change the grading of leather, but is it the prerogative of both buyer and seller to discuss a price adjustment. 3. Hair follicles are genetically caused defects and an extensive occurrence of it in at least two quarters will allow for a downgrading by one grade. 4. Pinholes are externally caused by bacterial damage and an extensive occurrence of it in at least two quarters will allow for a downgrading by one grade. 5. A skin is a "Torn" skin when a tear extends into the crown. 6. A natural scar is a healed scar and would remain a defect. 7. Rough surface is damaged grain. 8. "Loose grain" is where the grain is separated from the "base" of the leather. 9. "Vein marks" is a defect if it is very obvious and covering a substantial area of the skin.